If you have been following The Good Wardrobe since the start, you may know that on the 22nd of this month we celebrate an exciting milestone – it’s our first birthday! We haven’t had an event for a few months and I decided this would be an excellent time to get people together for a pre-Christmas Sew It Forward session so put the 5th December in your diary. 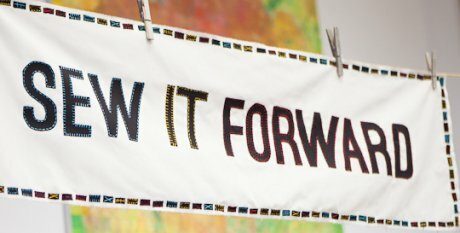 In case you are new to the site, Sew It Forward is our frock-friendly, style-hungry initiative which encourages people to share sewing, knitting and mending skills. We invite guests to bring a garment in need of some TLC and learn how to keep it looking good for longer. We’re teaming up with one of my heroes John-Paul Flintoff who will be talking about his Who Made Your Clothes project and his involvement with Fashion Revolution Day. 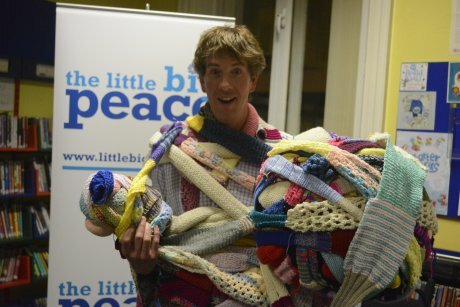 Among other things, John-Paul is a journalist, workshop leader, writer of books and mending enthusiast. His most recent book, How To Change The World, was created with The School of Life for whom John-Paul is a faculty member. If you have a garment with a tale to tell, bring it along and John-Paul might ask you to share the story of who made your clothes (and why it's important to you to know). Everyone is welcome, whether they are a novice, expert or somewhere in between, so come along to learn a new skill or share your wisdom. We’ll be handing out our Sew It Forward gift vouchers so you’ll get the chance to pass on your newfound skills by pledging to Sew It Forward this Christmas. Knowing how to mend and care for your clothes, or even make simple alterations equips you with the tools you need to keep your wardrobe looking as good as it can. Bringing a cherished garment back to life is an amazing feeling and very satisfying, so what better Christmas present to give someone than the gift of mending - it costs nothing but a little bit of your time. Outside of running The Good Wardrobe I do a fair bit of work in my local South London community and am a huge advocate for Streatham where I live. I organised a local darning class for a few people earlier this year, but haven’t yet run a Sew It Forward event in the area, so I decided our first birthday was the right time. 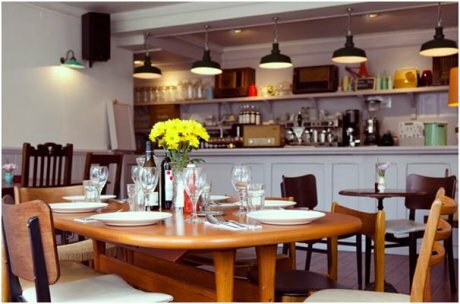 Our host for the event is The Railway, a brilliant local independent pub with vintage decor and new tearoom (the room we will be taking over for the evening). They serve London Ales and delicious seasonal food which will be available from the paid bar. The evening officially ends at 9pm, but guests will be very welcome to stay and enjoy the pub until closing time. The event is free to attend but advance bookings are necessary so we have a good idea of numbers ahead of time. Please do help us spread the word by sharing the event on Facebook, tweeting the link to this blog (using the hashtags #SewItForward and #WhoMadeYourClothes) or just tell folk via plain old fashioned email. I hope to see you there. For anyone who doesn’t live locally and thinks Streatham is hard to get to, at the risk of sounding like a Foxton’s estate agent, I think you should know that the area has excellent transport links. The Railway is right next to Streatham Common station which is a mere 15 minutes from Victoria station (for those in the centre or North London), East Croydon (for those down South) and Peckham (for the Overground and East London). West Londoners need not be disappointed either – the station has direct links to Shepherd’s Bush and West Brompton, and is less than 10 minutes from Clapham Junction (and its excellent connections to the West of the Capital). The pub is also about a 10 minute walk from Streatham Station which is on the Thameslink. At the risk of this turning into the longest description of how to reach Streatham by train, I will stop there. Oh, and the area has a very good bus network too. Just saying.